Hilary. Donald. And don’t forget Jill Stein, the Green Party candidate, or Libertarian Gary Johnson. No matter how much you love them, hate them, or have removed yourself altogether from politics this year, you can’t avoid the fact that come November, your taxes may change for better or for worse. Trump would cut the top income tax bracket to 33 percent from its current level of 39.6 percent. While Clinton has proposed several tax increases on wealthier Americans, including a 4 percent surcharge on incomes above $5 million. Trump would reduce the seven tax brackets in current law to just three, at 12 percent, 25 percent and 33 percent. Clinton said she will not raise taxes on the middle class. Her current proposals would have little impact on the bottom 95 percent of taxpayers, according to the Tax Policy Center. Clinton said she would not change the corporate tax rate. Trump would cut it from its current 35 percent to 15 percent. He would also cut taxes on “pass-through” business income from partnerships such as law firms to 15 percent. For child care costs, Clinton is proposing to help limit child care expenses to 10 percent of a family’s income. Trump wants to make all child care costs tax-deductible. 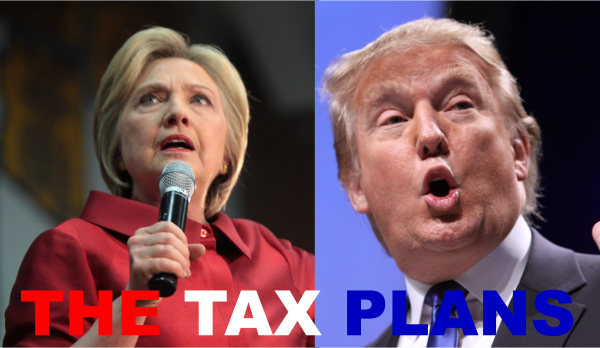 Trump would allow taxpayers to deduct child care costs from Social Security and Medicare taxes, while Clinton said she will ask the wealthiest to “contribute more” to Social Security, by raising the cap on income currently subject to Social Security taxes. No matter who is elected as President, we all have a responsibility to spend our money wisely and save as much as our budgets will allow. That way, whether it’s the candidate behind Door #1 or Door #2 who is elected, you’ll have done your part to be a responsible citizen. “Vote” for Capital and Worth as your choice for accounting, retirement and investment services. Contact C&W today.